The Brown-throated Three-toed Sloth is about the size of a domestic cat, ranging from 45-60cm. Like all sloths, it has long limbs and a small head for the size of its body. 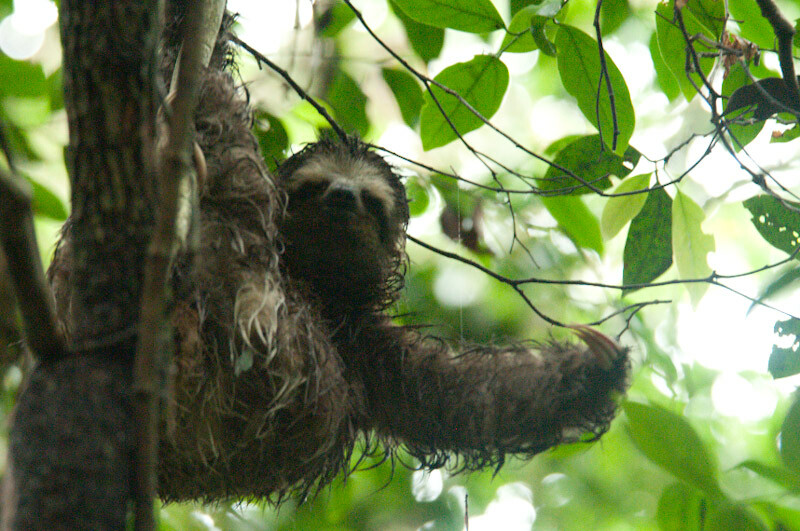 Sloths’ fur hangs ‘backwards’ compared to other mammals, lying from the stomach to their back. This allows the water to run off as the sloth hangs upside down in a tree. Sloths do not have visible toes but instead have long claws. In this species they have three claws on each foot, which enable them to hang from the branches of trees (2). The Brown-throated Tree-toed Sloth can also be distinguished from other species by its brown fur and upturned mouth, giving the sloth a constant ‘smile’. Despite its name, the Brown-throated Three-toed Sloth is often tinged with green, as blue green algae grows in its fur, especially in the rainy season. Adult males also have a yellow/orange patch of fur with a black stripe between their shoulders. Sloths have a low nutrient diet which leads to a slow metabolic rate. To manage this low energy diet, they have large segmented stomachs that weigh a third of the sloth’s total weight. The lack of energy means sloths move extremely slowly and they only descend the tree once a week to defecate. Keeping a constant temperature also becomes difficult with such low energy food, so sloths will move into sunnier parts of a tree to keep warm (2). The Brown-throated Three-toed Sloth lives in many Central and South American countries including WLT project areas in Brazil, Paraguay and Ecuador. The species was originally also native in Argentina, but is now extinct in this country, with a last sighting there in 1916. 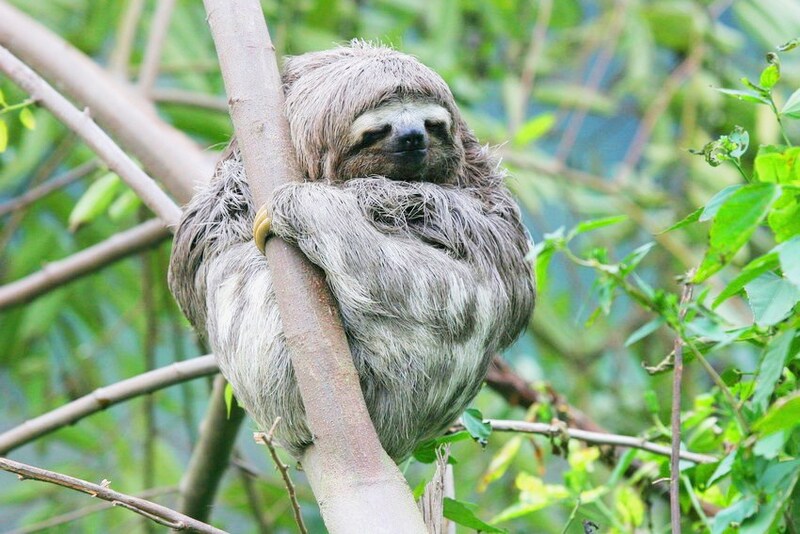 These sloths can live in a range of habitat, and these include lowland tropical forest, cloud forest, semi-deciduous forest and montane tropical forest (1). Although classified as Least Concern by the IUCN Red List, some populations of the Brown-throated Three-toed Sloth are threatened by habitat destruction, and the IUCN highlights declines in both Colombia and the Atlantic Forest of Brazil. In the Atlantic Forest the population has a very low genetic diversity and there is pressure from hunting. In Colombia there is a growing illegal pet trade. Sloths are also frequently killed on roads.